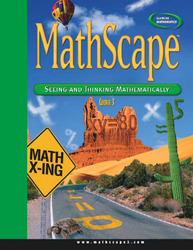 MathScape: Seeing and Thinking Mathematically is a popular NSF-funded program that has been updated to reflect current state standards. The 3 book series comes with full technology support for teachers and students, including StudentWorks, ExamView® Pro Testmaker, Virtual Labs, TeacherWorks, and online resources. Student Editions Available in 2 Formats: Consolidated Hardcover or Individual Softcover Units!